Does Your School Offer Post Vacation Lice Checks? Lice Treatment Center's staff encourages parents and teachers to have their schools conduct post-holiday or post-vacation lice screenings. It is quite common for families to become exposed to head lice when mixing with crowds at theme parks, using public transportation or even attending neighborhood slumber parties. So,careful head lice screenings may be able to prevent the spread of head lice after vacations. If your school does conduct post-vacation checks, talking to kids in advance about what to expect during a scheduled school check will make it easier and more successful for parents, kids, their teachers, administrators -- and the technicians themselves. The children should be assured that lice checks don't hurt and will only take a few minutes. Let them know that a technician will most likely run a long Q-tip through the hair to look for bugs and their eggs.Therefore, parents should make every effort to have their child's hair washed the night before the lice check and combed or brushed through thoroughly the day of the check. Not being able to get the stick through the hair takes extra time and makes it much harder to search for bugs and nits." It’s very important to acquaint children with what will happen during the check session to allay fears. If a child is fearful or reluctant to be touched by strangers, parents should explain that the check is easy and won’t take long. It’s also okay for a student to ask to go last or want to go first. Some kids even need to hold hands with a friend or want to sit on a teacher's lap, etc. And if a student is afraid of the magnifying lamps used to inspect the hair, he/she can be checked under a strong ceiling light. That’s okay too! Technicians are trained to be patient and flexible. If a school's policy is to send kids home if they have lice, parents should share this information with their children so they will be prepared if they are found to have lice. Parents and teachers should tell kids in advance that having lice it is nothing to be ashamed of. It does not mean that they are dirty. In fact, lice prefer clean hair over dirty hair. Kids should know that lice don't carry diseases and they don't make you sick. In summary, let kids know that although being treated for lice is a nuisance and can be time consuming, it doesn't hurt and is nothing to be afraid of. And remember, a parent’s attitude sets the mood. So, don’t freak out if your child is found to have lice. Nobody gets them on purpose, and nobody spreads lice on purpose (even that neighbor who had the sleepover and should have known better). 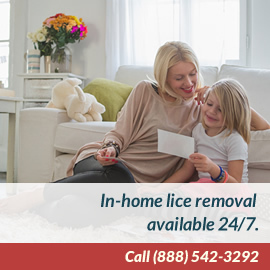 A lice infestation can be easily treated by Lice Treatment Center® either in the privacy of a family’s home or at a Lice Treatment Center® location by calling 1-888 LICE AWAY/1-888- 542-3292.